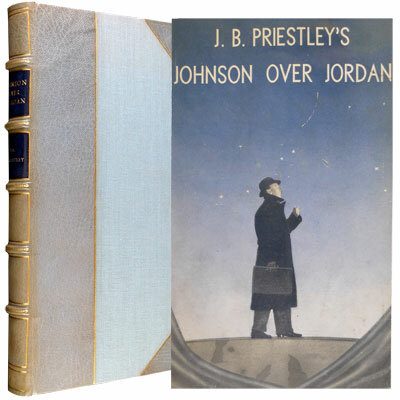 A smartly bound copy of J.B. Priestley’s ‘adventure in theatre’, Johnson Over Jordan – the story of ‘everyman’ Robert Johnson who attempts to make sense of a life half lived – was the play he considered his finest and most ambitious achievement. Also features an essay by Priestly on the writing of the play and its origins, and the critical reception of the stage production. Illustrated with 8 full page black and white photographic plates of the original 1939 stage production, which starred Ralph Richardson and featured a musical score by Benjamin Britten. With a black and white photographic portrait of the playwright tipped in to front endpaper and the front panel of the original dust jacket laid in. 1814 - John Murray, London - A New Edition, Corrected. A beautifully bound, compact collection of recipes, household advice, and medical tips, this volume includes ingenious articles such as: ‘Easy Method of Curing the Sea-Scurvy’, ’To Increase the Force of Gun-Powder’ and ‘Method of Rendering Assistance to Persons in Danger of Drowing' to name but a few. Helpfully organised into categories such as ’Agriculture', ‘Distilling’ and ‘Pleasing Experiments’. 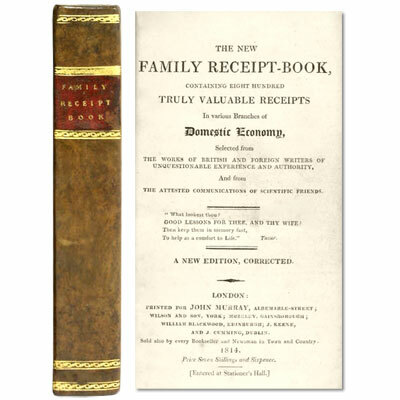 According to Arnold Oxford (English Cookery Books) this compilation was published to accompany Maria Rundell’s highly successful New System of Domestic Cookery’. Although Oxford states that this was written by Mrs Rundell, it is more likely that the compiler was David Pugh who worked on a number of ‘Family-Receipt’ books for several publishers under the pseudonym of David Hughson. 1813 - Chez Delacour, Paris - Early Edition, Nouvelle Édition Considérablement augmentée. Rare. Two short works in one. Neil’s successful Broadway play, which premiered in 1965. The plot concerns two mismatched roommates: the neat, uptight Felix Ungar and the slovenly, easygoing Oscar Madison. Walter Matthau starred as Oscar Madison, and went on to play the same part in the film adaptation in 1968 together with Jack Lemmon as Felix. Simon adapted the play in 1985 to feature a pair of female roommates (Florence Ungar and Olive Madison) in The Female Odd Couple. In 2002 he wrote an updated version Oscar and Felix: A New Look at the Odd Couple, which was performed on Broadway with Matthew Broderick playing Felix. In addition to the film and theatre, The Odd Couple has been the basis of a number of successful sitcoms, notably the ABC sitcoms The Odd Couple (1970-75) and The New Odd Couple (1982-3). A new series of The Odd Couple is scheduled to begin on CBS in September 2014 starring Matthew Perry and Thomas Lennon. A wonderful early edition of Eliza Smith’s best-selling compendium of recipes, home remedies, and medicinal guidance, and featuring six engraved folding plates showing table settings. 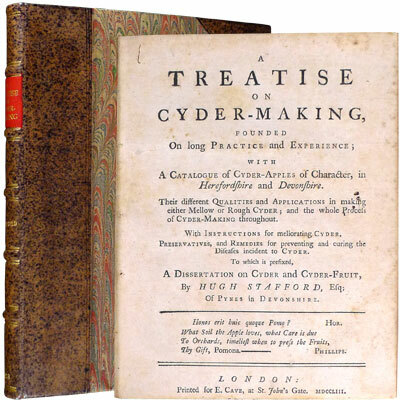 A great success in London, where it is was originally published in 1727, it later had the distinction of being the first cookery book printed in America, when it was printed and published in Williamsburg, Virginia, by William Parks in 1742. Created as a household guide for the 18th century urban housewife, Smith’s extensive experience as a cook in various aristocratic houses, in addition to her chiding of the male culinary writers of the period, whom she claimed concealed their best recipes from the public, made her a popular figure amongst her contemporary female audience.